Now in the Rheinisches Landesmuseum, Trier. Image from this site. 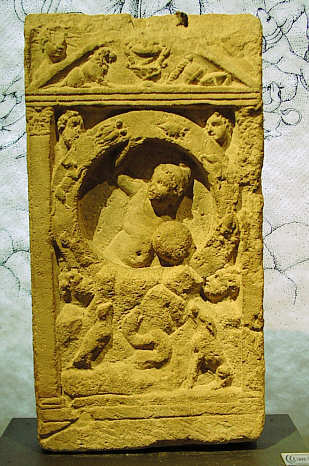 Stone relief (H. 0.73 Br. 0.25 D. 0.12), found at Treves in the Altbachtal in 1928. Treves, Prov. Mus. Loeschcke in TrZ IV, 1929, 149 and 163 with Pl. XIII; Tmp. Trier, fig. 28; Leipoldt; fig. 30; Esp. Rec. Gaule, XI, 54ff, No. 7737; Vermaseren in Studia van Hoorn, Pl. XXII, 4. See fig. 237. On the relief the front of a temple is represented: two columns with capitals, supporting a tympanum. Between the columns a representation of Mithras' rock-birth. In his l.h. 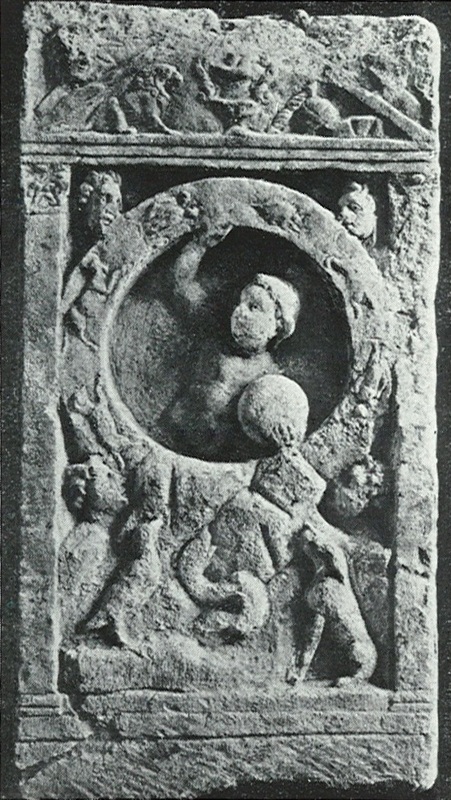 the youthful, naked god carries a globe and with his upraised r.h. he supports a circle, on which six signs of the Zodiac. From l. to r.: Aries-Taurus-Gemini-Cancer-Leo-Virgo. In the four corners, which are left open by the circle, are the busts of the four Winds: Zephyrus (r. upper corner) and Eurus (l. lower corner); Notus (l. upper corner) and Boreas (r. lower corner): On the rock a raven, serpent and sitting dog, all three of them raising their heads towards Mithras. 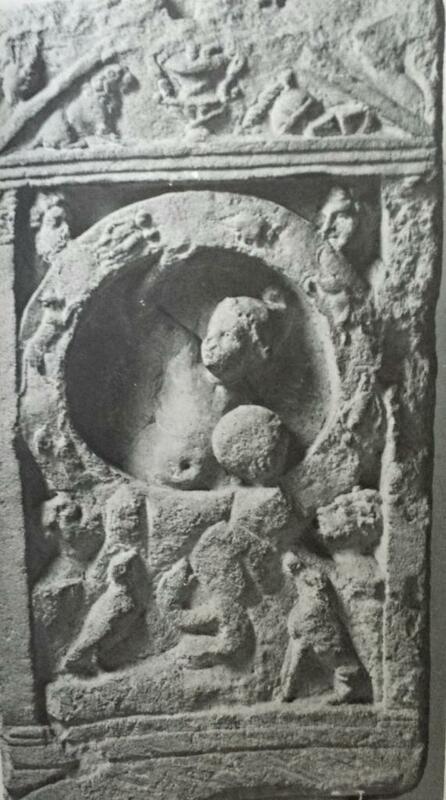 Within the tympanum in the middle a cantharus, entwined by a serpent. To the left of it a lion in a threatening posture. To the right a bird. Before the latter a twisted, oblong object (thunderbolt), and behind it a small cantharus(?). In the upper corners the dressed busts of Sol (l) in radiate crown, and of Luna (r), partly lost.